And brioche is so FANCY! I’m going to feel fancy. Sophie, plain flour (aka all-purpose) should be just fine. You can use bread flour, but the finished monkey bread won’t be quite as tender. Lindsay, this sounds fabulous. Love those Land O Lakes recipes! YUM YUM YUM!!! I want to eat this right now with a cup of hot chocolate in front of the fire. Sounds like the perfect cozy evening! So rich and decadent. Definitely will be the centerpiece of my Christmas breakfast! Just terrific dear Lindsay! OMG I don’t make monkey bread enough, but DANG this looks good! I just love reading your posts, you are one funny gurl! Monkey bread is literally taking bread, cake, donuts, cinnamon rolls, and French toast, and marrying them all together. Let’s just say their child is freaking beautiful. This monkey bread looks so decadent and delicious! Who wouldn’t want to dig into the bread right away?! You had me at “Gooey”. Hi Lindsay, quick question can you use the left over bread dough to bake a loaf of brioch? Love all your recipes btw!! Wow, this monkey bread looks so delicious!! I’m definitely going to give it a try. Can’t wait! I have just made this delicious monkey bread, and from my 10 years old son: THANK YOU, THANK YOU, THANK YOU!!! I am gluten free. Do you think this brioche recipe will work with a cup for cup gf blend like Bob’s Red Mill? Hey Jessica! We aren’t super familiar with GF flours so can’t really say. We’d love to hear how it goes if you give it a try! 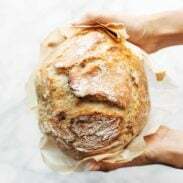 nice recipe and photo walk-through, and yes I appreciate being “bread dumb” too, so thank you for this recipe! After watching your IG story I was hooked! Quick question, what’s the max time the dough should be in the fridge? Thanks! We’ve kept it in for a few days! hi! i saw your ig story about turning these into rolls. would it be possible to make the rolls ahead and then freeze it? what will the directions be for thawing and baking? This looks amazing and really, the videos really inspire me. Thanks for all you do! I enjoy reading your blog a lot. Thank you for these recipes. They are so helpful.